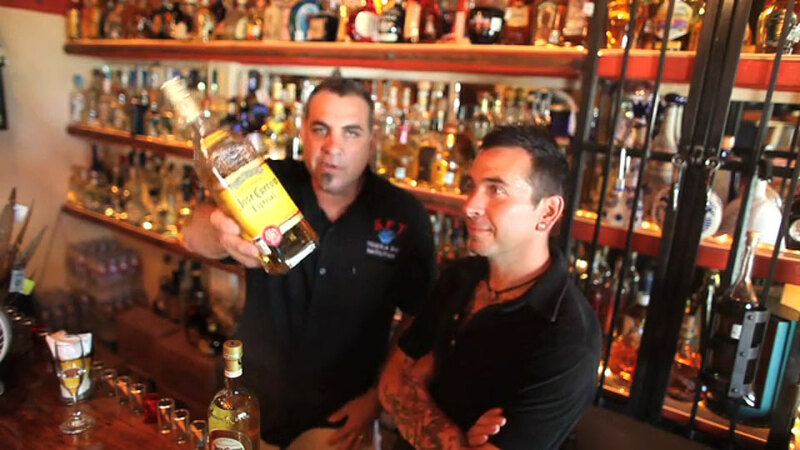 Our latest video featuring Mark Alberto Holt and Gabbi Villarrubia, our tequila experts from Sayulita, Mexico, is all about tequila and hangovers. I asked them to address the hangover issue because people ask me about it all the time – and I always tell them that if you drink GOOD tequila that’s made from 100% pure agave, you won’t get a hangover. Mark and Gabbi explain why this is true. You should remember that there is a difference between a “hangover” and just straight out alcohol poisoning. If you drink an entire bottle of high quality tequila by yourself, you might not feel so great the next day, but that’s because you’ve pushed it too far and not because tequila is a sure-fire hangover inducer, as some people wrongly believe. Personally, I find that if I drink even a little bit of these “mixto” tequilas (tequila that isn’t “100% de agave”) I’ll end up getting a headache and feeling crappy the next day. So, stick with the pure stuff, and your body will thank you. I am a firm supporter of the idea that a good tequila will not cause a hangover. One important factor that I have learned from my other tequila drinking amigos is that you also have to be careful with reposado and anejo tequilas because of the impurities you will be consuming from the oak barrel. The main reason a good blanco/silver/plata tequila does not cause a hangover is because in essence it is simply distilled agave juice with no additives. That is what makes tequila so special, it has amazing flavor without needing any changes to it. Through the course of 11 years I spent in the alcohol sales and distribution industry you learn a few things as I did. While drinking was considered a part of the job on a daily basis as well as bar promos in the evening to further sales; you eventually learn the tricks of the trade very quickly. Hangover facts: If you stick to premium or top shelf liquors, you will feel better the following day. This is not fiction it is a fact. This is because top shelf liquors usually go through a more extensive distallation and filtration process, or sometimes even two or more distallations to remove impuities in the spirit. With each act of the distallation process a spirit goes through it removes impurites in the spirit as well as does charcoal filtering. The downside is the spirit looses a little bit of its flavor during the process as well. The upside is the less impuites you put into your body, the easier it is on your body to filter them out. You do not want the final distallation step which occurs in your body, to be a hard one on your liver and kidneys. If they have to work harder at removing extra impurities then you are more apt to become dehydrated over the course of the evening through frequent trips to the restroom. Those trips and the lack of rehydration before going to bed results in a hangover the following morning. So stick to the premium top shelf brands, straight up or neat as some say, leave the mixed drinks with well liquors that are full of sugars and impurities alone, and drink a big glass of water before you go to sleep. Follow those rules and you will feel much better the following morning. 100% agave tequila will not cause a hangover. As mentioned, if you put down 750ML by yourself, that on the border of alcohol poisoning. Otherwise, you’re fine the next day – a little slower than if you didn’t drink at all, but nothing like a sugar filled rum, etc. Just drink shots or doubles.. best of all the boozes. No junk tho (i.e. curevo) – a good Reposado from a decent company that is 100% agave is all you need for shots or Añejo (more expensive, little difference if you are shooting it, sipping, it’s worth the price difference). Blanco’s, as along as they 100% agave, are fine, but don’t expect much, they designed to be mixed. jose cuervo is just junk. so unless in college and broke, avoid, there are good tequilas that only cost $8-$10 more and are pure if on a budget. I agree. Stick to the higher quality, 100% agave tequila and you should be good to go the next day so long as you aren’t drinking excessively. I’ve even found that certain cocktails made with the 100% agave tequila and adjusted ingredients that leave behind all the sugar have the same effect. One example being cocktails like a Tommy’s Margarita that only uses pure lime juice and pure agave nectar as a sweetener. Nothing like waking up functional at 8:00am the night after some tasty Margaritas!